As a gamer that regularly reviews big titles and otherwise has the means to procure his own video game entertainment, it isn't often I get to experience the joy of a thoughtful video game related gift. Instead, I give things to my family and live vicariously through them. What did they get this year? Perhaps the better question is why the hell is the top image of this article the abysmal failure that was Power Gig: Rise of the Six String? Who could have possibly slighted me so terribly that I would spend a large chunk of money for such a horrible thing? For that matter, what retailer allowed me to purchase this monstrosity? The answer, quite simply, is Power Gig recently dropped to $15 at my local game store, and I couldn't resist. 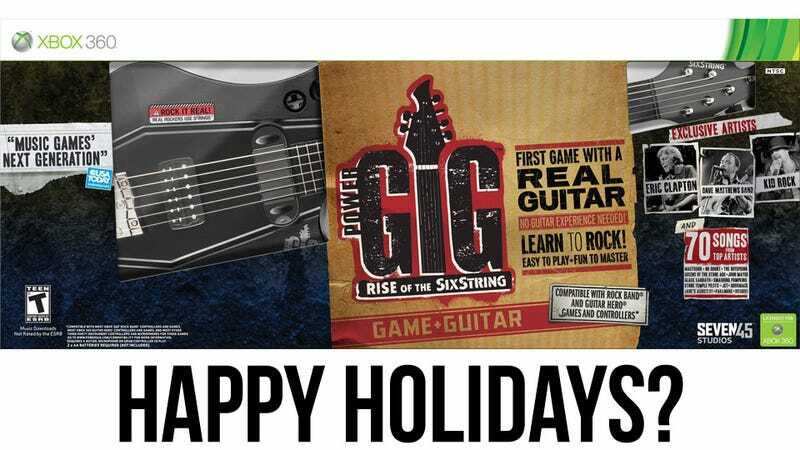 My older brother, an avid guitar player and fan of all things that mix guitar playing and video games was the recipient of the present, which he later heralded as "completely unplayable". That's high praise coming from someone that once bought me a washboard tie for Christmas. I also gave him four pounds of coffee and a Jinx t-shirt. I'm not completely cruel. Just look at my nephews. You all know what this is, and so does my nephew Xavier. He's the proud owner of the Skyrim collector's edition now, keeping the massive dragon statue atop the piano at my mother's house with her other collectibles, something that amuses me to no end. Xavier was also the proud recipient of a Diablo III headset someone handed to me during BlizzCon. Go gift recycling! His father apparently got him the World of Warcraft headset from Creative for Christmas, which made my gift even sweeter. Another nephew, Mattie, found himself the proud new owner of a Mega Bloks Need for Speed Porsche GT3 RS, or as I like to refer to it, 630 pieces' worth of sit down and shut up. This is not something the boy often does. In fact, it's more likely he will end up eating the entire thing, box and all, and then tumble about the room bragging about it than it is he will put it together. Who knows, maybe I just created the world's next whoever it is that drives Porsches really fast guy. I'm sure he has a name. My grand-nephew (is that a thing?) and my niece didn't show up for Christmas dinner at my parents' house, so I didn't get to see the look on Caleb's face when he opened up a brand-new copy of Skylanders: Spyro's Adventure for his Wii. I gave him the game itself, two figures, and wrapped up two more figures for his sorta older brother so the two could play together. I am hoping they were overjoyed and excited, but I will never know because Caleb's mom is an uncaring jerk. Oh come on, she's a lovely person. I never once felt she was really an uncaring jerk, except for that split-second after being told she wouldn't be there. Uncaring jerk. It's better to give than receive they say, and this Christmas the saying proved true, as no one gave me anything that felt as good as what I gave them. I win the holidays again. How about you? What gaming gifts did you share with your family and friends this holiday season?